Poup Alerta is a Brazilian application targeted at Brazilian computer users who are interested in saving some money while shopping online. If you are interested, you may visit poup.com.br and download the promoted program intentionally. If this is the case, it is likely that you have done some kind of research prior to the installation, and you must know that the program does not have a good reputation. On the other hand, you may have installed the application without knowing anything about it. Either way, we should discuss Poup Alerta removal. 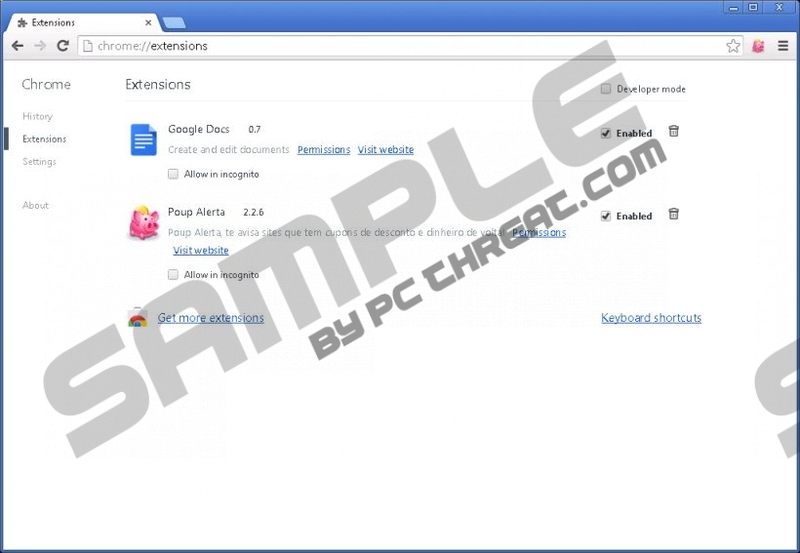 Many computer users install Poup Alerta extension onto the browsers by accident. The program’s installer may be attached to more desirable applications, and you may execute it without even realizing it. Due to this, some believe that the program may install illegally, without authorization. Even though this is unlikely, you still should delete Poup Alerta from the operating system. You also need to examine the system and recognize all unreliable programs. You will need to delete them eventually. So, what happens if Poup Alerta enters the operating system? First of all, the program installs tracking cookies to record your activity. If you do not delete the cookies, they will record your browsing history and will help adware creators and affiliated parties to select more appropriate advertisements. Unfortunately, this does not mean that all of the displayed offers will be beneficial to you or will deserve your trust. Our malware researchers here at pcthreat.com suggest that you remove Poup Alerta ads on centauro.com.br, saraiva.com.br, walmart.com.br, and other popular Brazilian web stores. There is only one task that Poup Alerta needs to perform – present beneficial deals. Unfortunately, the disturbing application fails miserably at it. According to our researchers, Poup Alerta enables any kind of offers representing sponsored links, regardless of whether they are useful to you or not. Because of this, the advertisement-supported program is considered to be intrusive, annoying and wasteful. Do not allow the program to take up space and resources which could be used for more beneficial services, and remove it from the operating system right away. Do you want to remove Poup Alerta from the operating system? This is a decision we applaud. You can delete the advertisement-supported program in two ways. You can choose the manual removal option; however, it is more suitable to experienced users who know how to delete all remaining files as well. You can also install authentic security software. Besides ensuring reliable, full-time Windows protection, this software will delete Poup Alerta automatically, and you will not need to worry about the removal process. Go to the Task Bar and click Start. A user menu will show up. Finally, select the undesirable application and click the Remove button. Go to the Task Bar and click the Windows icon to open the Start menu. Select Control Panel for a menu with more options and click Uninstall a program. Navigate to the program you want to delete, right-click it and select Uninstall. Move to the bottom-left corner of the Metro UI menu to open a mini desktop window. Right-click the window, select Control Panel and then go to Uninstall a program. Once you detect the application you chose to delete – right-click it and select Uninstall. Quick & tested solution for Poup Alerta removal.